Frozen fingers is not fun. Repeat. Frozen fingers is not fun. Knowing how cold everyones' toes and fingers were getting yesterday and today, I invited my friends Chloe and Bree over for some R&R and manicures. I've never really done other girls' nails before, but it was fun! And their right hands looked much better than mine ever do. Here on Bree's hands is China Glaze's First Mate with a shiny layer of Snow Globe on top. 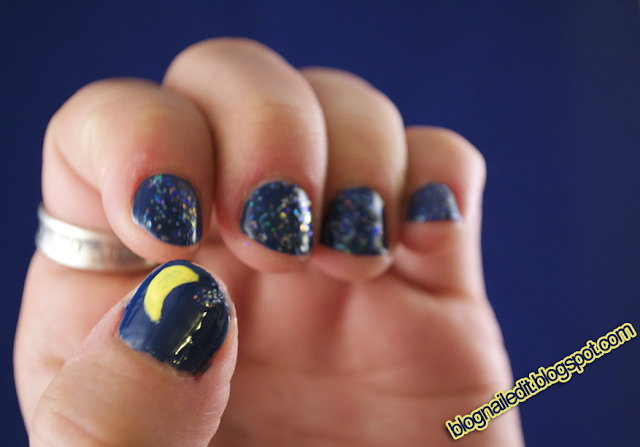 For her moon thumb, I painted Sally Hansen's Insta-Dri Lightening using the smallest paint brush I could find. (I really need to invest in some real nail polish brushes for this sort of detail.) We went with the moon because I had at least two major brain farts last night. I painted all of Bree's nails, except for her thumb, for some unknown reason. So we decided to paint it differently, since it clearly wanted to be different anyway. Next up are Chloe's nails. 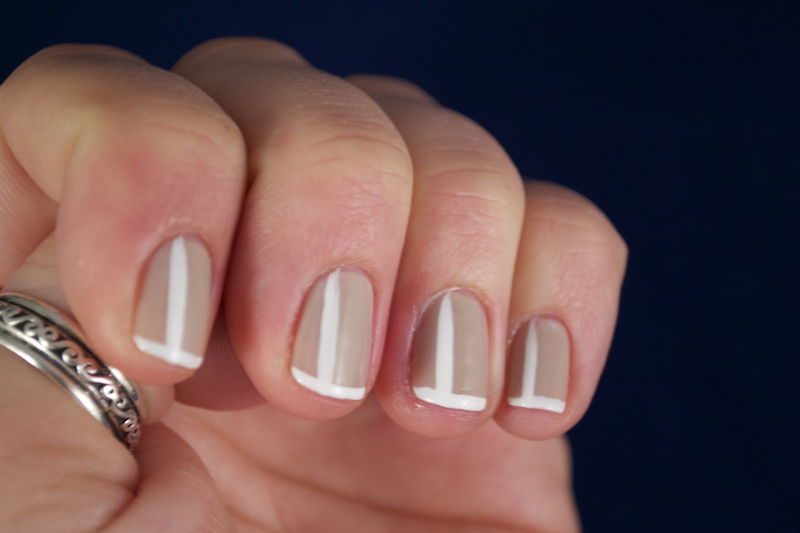 Chloe opted for Sally Hansen's Insta-Dri Mochachino, with a stripe of Sinful Color's Flower Girl (a smaller nail art brush). We varied the position of the stripes to spice it up a little. I loved this color combination she picked, and actually got a little inspired by it for my own manicure. 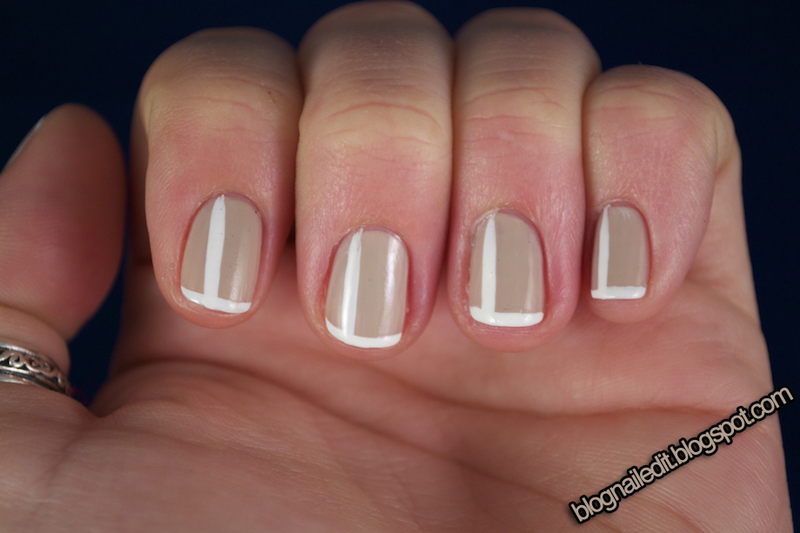 Stealing Chloe's idea, I did a french with a twist. Well...I guess a french with a stripe. The stripe and tips were done using Sinful Color's Bad Chick (white) and Essie's Sand Tropez. I absolutely love Sand Tropez. It's subtle and sort of matches a natural nail color, but it's also a two-coater. Some french bases I've seen are too pink and shimmery. I definitely prefer this solid creme you're seeing. 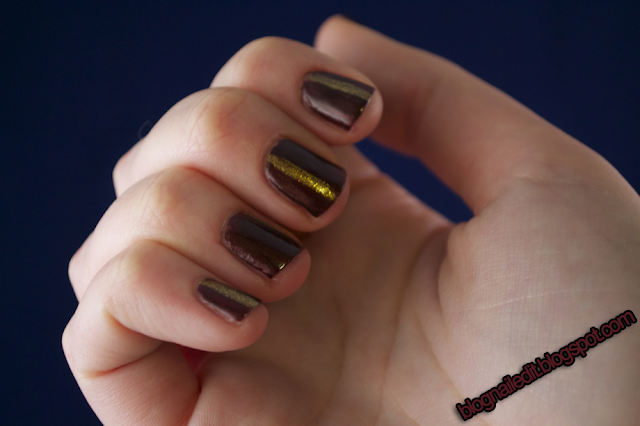 Cremes are hands down more my style than anything with shimmer, like Chloe's Mochachino. That's why I recently ordered the OPI Pirates of the Caribbean collection on Amazon, and am on the lookout for Illamasqua's Load (see a swatch of this at Kayla's blog). Gorgeous huh? Now that you're in love with Load, take a moment to connect that word to that color. What does it mean? It's a lit....OH! OH MY! OH YEAH! I think this is a great idea! I would love to do somebody's nails but I always think it would take too long. The girls I know don't use base and top coat and are not too careful with application, so they are no used to a thorough manicure.